The unequalled comfort and precision mowing deck score points for the Viking MT 6127 ZL garden tractor: the 3 blade system ensures the perfect cutting pattern over a width of 125cm, catching grass even right at the edge of the mowing width. The grass catcher box has a huge 350 litre volume and can be emptied effortlessly from the seat. Together with the Briggs and Stratton 23HP engine, the forward/reverse drive lever, the ergonomically designed cockpit with LCD display, extremely small turning circle and excellent handling performance, lawn mowing becomes a rewarding experience. 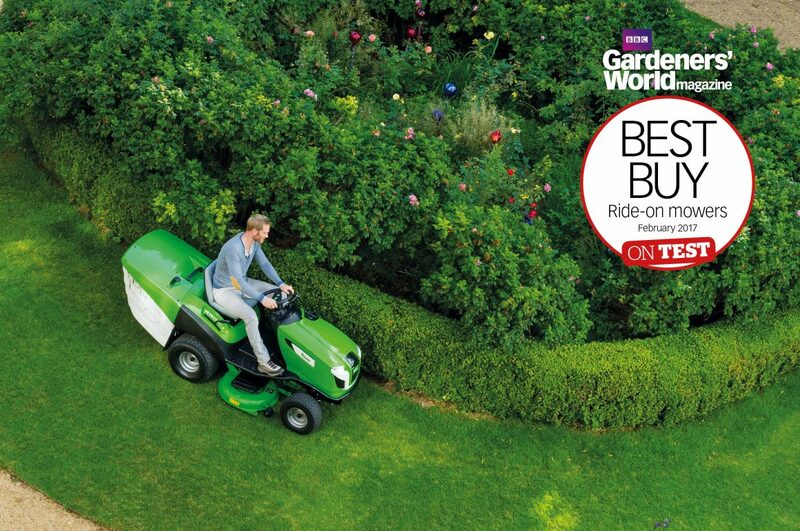 With the Viking MT 6127 ZL garden tractor, even large lawns can be mowed effortlessly. Sit down and start up the powerful Briggs and Stratton 23HP twin cylinder engine with ease. The LCD display on the control panel ensures that everything is under control at all times, for example the LCD indicator informs you when it is time to empty the grass catcher box. All the other functions such as cutting height adjustment, blade clutch or grass catcher box emptying can be performed from the practical yet incredibly comfortable driver's seat. Mowing deck with 3 blade system - The 3-blade system mows strips that are125cm wide,The 'Grass Guide System', operating on both sides, guides the blades of grass inwards from the edge enabling a cut which is wider by a few centimetres. Central cutting height adjustment - The cutting height can be adjusted to one of 8 levels via a lever. The user can adjust the cutting height quickly and simply. Electromagnetic blade engagement - The electromagnetic blade engagement activates the mowing deck blades at the touch of a button on the control panel. Innovative forward and reverse gear - The arrangement and positioning of the pedals is the same as a car: drive pedal on the right, brake pedal on the left. The forward/reverse drive switch, developed by VIKING, is straightforward and easy to use - perfect for working quickly. Thanks to the simple reversal mechanism, the driving direction can be selected using the drive direction lever. Actuation of the hydrostatic gearbox is via the drive pedal and enables precise selection of the driving speed. Comfortable seat adjustment - The comfortable seat adjustment allows anyone to adopt an optimum sitting position on the lawn tractor. The seat can also be folded forwards. Single pedal hydrostatic drive system - Right pedal - drive, left pedal - stop. Comfortable single pedal-drive system with hydrostatic transmission. Robust frame construction - The welded frame construction is extremely sturdy. Its shape is the result of many years of expertise and intensive long-term load testing. The bumper protects the appliance and extends up to the footplate. Grass catcher box - The capacity of the grass catcher box is an impressive 350 litres on the T6 Series. Emptying is performed without back strain from the seat by conveniently pressing a lever. Removal and installation of the grass catcher box has also been made extremely easy for users: a brilliant solution for superior comfort! Cruise control - The cruise control is electronically activated and enables relaxed working, particularly during prolonged mowing on large lawns. LCD display - The LCD display shows the most important functions using symbols. It is designed to indicate the following functions: operating hours, battery voltage, grass catcher bag ready, fuel tank level, oil pressure control, grass catcher bag filling level, driver seated, mowing deck activation, cruise control, electromagnetic blade clutch programming and fault indication. Mulching insert - The mulching insert prevents grass from entering the catcher box, returning it back into the soil as a fertiliser. With regular cutting using a mulching mower, the grass is chopped up into fine particles, returning valuable nutrients and moisture to the lawn.